Reading, UK, 30 March 2017, Despite 93% of consumers revealing they are more likely to buy if they receive a positive customer experience, UK retailers are struggling to deliver adequate, consistent service new research suggests. Companies were unable to answer 46% of customer queries received on email, the web, Twitter and Facebook, with only 7.5% responding on all four channels - and a mere 2.5% providing a consistent, accurate answer across all of them. 69% of consumers say their expectations are continually rising, yet overall many retailers seem to be settling for providing service that is average at best. The number of questions answered on Facebook dropping by 20% since 2016 to just 39%, while Twitter and company websites also saw performance worsen, with only 44% of tweets and 62% of web queries receiving a successful response. In 2015 the respective figures were 45% and 65%. 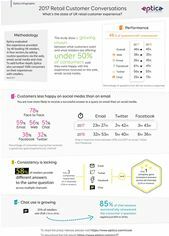 No wonder that on average under half (47%) of consumers said they were happy with the experience received on the web, email, social media and chat. Under a third (32%) of consumers were satisfied with retail service on Twitter, 38% on Facebook, 51% on chat, 56% on the web and 59% on email. This lagged behind satisfaction with the in-store experience, where 78% were happy with the service they received. The only channels to see improvements were email and chat. Successful response rates to emailed questions leapt, from 55% in 2016 to 74% in 2017, meaning consumers are now more likely to get their query answered on email than any other channel. 90% of consumer electronics retailers replied on email, ahead of food and drink (80%), fashion (65%) and entertainment (60%). Average response time on email dropped dramatically, from 32 hours 53 minutes to 23 hours 27 minutes. 25% of retailers offered chat, up from 13% in 2016, with 85% of chat sessions successfully answering a customer query in an average time of just 5 minutes 24 seconds. Consumer electronics retailers successfully answered most questions overall, with a 66% success rate across the web, email and social media. They were followed by fashion (64%), then food and wine (44%) with entertainment bringing up the rear on 43%. However, the Study uncovered wide variations between retailer performance, even within the same sector. One fashion retailer answered an email in 7 minutes – another took nearly 53 hours to answer the same question. 91% of consumers say they want a fast and accurate response to their query. Yet while response times on social media halved, accuracy actually reduced. The full findings of the research are available in the 2017 Eptica Retail Conversation Study, which can be downloaded from https://www.eptica.com/rcc17. Eptica has offices in Paris, London, Boston and Singapore. Follow us on Twitter: @Eptica.